Interview on ITV’s ‘London Tonight’ with Lucy Cotter. 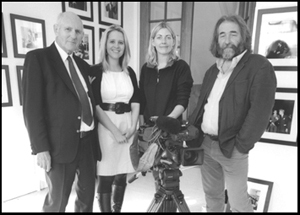 Picture (left to right): Derek Cross, Lucy Cotter, Gemma Creely (camera operator) & John Lidster from the Atelier Gallery. Rare photos of 60’s stars on show. Rediscovered archive photos of the Beatles, the Rolling Stones and other stars from the 1960’s have gone on display in Leigh-on-Sea. Over 50 images by photographer Derek Cross form the ‘Unseen 1963’ exhibition at the town’s Atelier Gallery. Most of the pictures were taken in 1963 at Southend Odeon, which at the time drew the biggest names from the world of show business. The exhibition also features the likes of Cliff Richard and Roy Orbison. The Searchers, Duane Eddy, Dusty Springfield, The Kinks, Frankie Vaughan, The Dave Clark Five and Bo Didley are also among the stars to have been caught on camera. The photos, which had never been seen by the public before, came to light when the original negatives were rediscovered and passed to friend and local printer, John Salim. 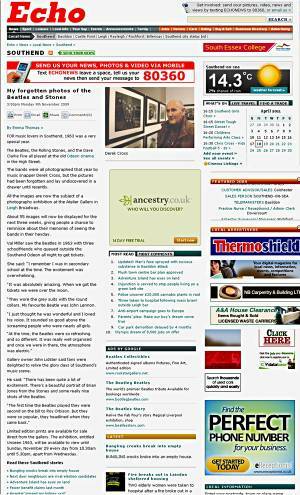 “At the time were just part of his work and these were probably the ones he didn’t sell to Fleet Street’” said Atelier Gallery owner John Lidster. “So he knew they were there, but just didn’t realise the significance of them. “Derek was a professional photographer for the press, so he had access to them and a lot of the shots are very relaxed in the dressing room, or just off stage. John explained he needed little persuasion to put the photographs on display when they offered to him. “We’ve been very busy, we’ve had hundreds of people coming in, most of them local because the shots are Southend Odeon. My forgotten photos of the Beatles and Stones. ‘Evening Echo’ – 9th November 2009 by Emma Thomas / photo by Steve O’Connell. For music lovers in Southend, 1963 was a very special year. The Beatles, The Rolling Stones, and the Dave Clarke Five all played at the old Odeon cinema in the high street. The bands were all photographed that year by music snapper Derek Cross, but the pictures had been forgotten and lay undiscovered in a drawer until recently. All the images are now the subject of a photography exhibition at the Atelier Gallery in Leigh Broadway. About 55 images will now be displayed for the next three weeks, giving people a chance to reminisce about their memories of seeing the bands in their heyday. Val Miller saw the Beatles in 1963 with three school friends who queued outside the Southend Odeon all night to get tickets. She said “I remember I was in secondary school at the time, the excitement was overwhelming. “It was absolutely amazing. When we got the tickets we were over the moon. “They wore the grey suits with the round collars. My favourite Beatle was John Lennon. “I just thought he was wonderful and I loved his voice. It sounded so good above the screaming people who were nearly all girls. Gallery owner John Lidster said fans were delighted to revive the glory days of Southend’s music scene. He said “There has been quite a lot of excitement. There’s a beautiful portrait of Brain Jones from the Stones and some really nice shots of the Beatles. “The first time the Beatles played they were second on the bill to Roy Orbison. 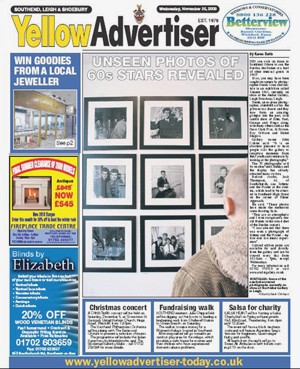 Yellow Advertiser’ – 25th November 2009 by Karen Davis / photo by Mark Cleveland. Did you rock on down to Southend Odeon to see the Beatles, the Stones or a host of other musical greats in 1963 ? If so, you may have been caught on camera by photographer Derek Cross and feature in an exhibition called Unseen 1963 at the Atelier Gallery, Leigh Broadway, Leigh. 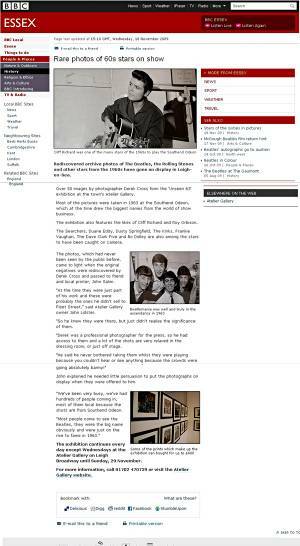 Derek, an ex-press photographer, stumbled across the pictures in a drawer and they now form an amazing glimpse into the past with candid shots of John, Paul, George and Ringo along with many others such as the Dave Clark Five, Jo Brown, Roy Orbison and Helen Shapiro. The 55 photographs will be on show until Sunday and the display has already attracted many visitors. Retired roofer, Jack Thompson, 66, of Southchurch, saw Johnny and the Pirates at the cinema, which used to be situated in Southend High Street on the corner of Elmer Approach. He said: these photos have made the memories come flooding back. “They are so atmospheric and I even recognised a few old friends in the crowd shot of the Beatles concert. Atelier Gallery presents a selling exhibition of unpublished photographs taken at Southend-on-Sea Odeon cinema in 1963 by local press photographer. 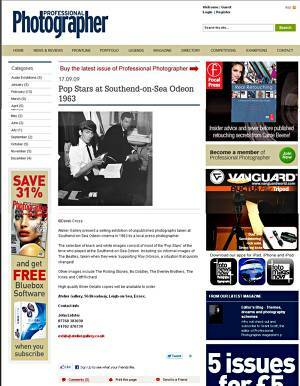 The selection of black and white images consist of most of the ‘pop stars’ of the time who played at the Southend-on-Sea Odeon including six informal images of the Beatles, taken when they were ‘supporting’ Roy Orbison, a situation that quickly changed ! Other images include The Rolling Stones, Bo Diddley, The Everly Brothers, The Kinks and Cliff Richard. High quality Silver Geletin copies will be available to order.